May 28, 2010 — The National Transportation Safety Board (NTSB) has identified a critical safety issue with General Electric Company (GE) CF6-45/-50 series turbofan engine low pressure turbine (LPT) stage 3 (S3) disks that requires immediate action. The investigations of several recent uncontained LPT S3 disk failures have determined that the CF6-45/-50 engine LPT S3 disk, a critical, life-limited rotating engine part, can fail unexpectedly when excited by high pressure (HP) rotor unbalance vibration resulting from localized high pressure turbine (HPT) blade material loss. A turbine disk failure can release high-energy engine debris capable of damaging an airplane and endangering its passengers. This failure mode was identified in the 1970s, but an uncontained failure did not occur until 2008. GE established inspection procedures to mitigate this failure mode on August 28, 2009, via GE Service Bulletin (SB) 1307. However, an uncontained LPT S3 disk failure occurred following an inspection using the new procedures, which has raised concerns that the procedures are insufficient to prevent additional LPT S3 disk failures. Although the investigations of these events are ongoing, the NTSB believes that immediate action is required to address this safety issue. On July 4, 2008, a Saudi Arabian Airlines (Saudia) Boeing 747-300 experienced an uncontained failure of its GE CF6-50 No. 1 engine, during initial climb after takeoff from King Abdulaziz International Airport, Jeddah, Kingdom of Saudi Arabia. No injuries were reported. The nonrevenue repositioning flight was going to Jakarta, Indonesia, for maintenance. The flight crewmembers reported that, following takeoff, they reduced the No. 1 engine thrust after noticing fluctuations in its exhaust gas temperature and fan speed (N1). According to the captain, the fluctuations continued during the initial climb, and, about 1 minute later, at about 1,100 feet above ground level (agl), the engine’s low oil pressure warning illuminated, and the oil quantity indicator read zero. The flight crew shut down the engine, dumped fuel, returned to the airport, and accomplished an uneventful landing. Postflight inspection of the airplane found that the aft end of the No. 1 engine was missing and that airplane damage, including penetration of the airplane’s left wing and flaps, was consistent with impact from parts exiting the engine. Examination of the No. 1 engine found that the engine’s LPT S3 disk had separated at the forward spacer arm and that all components aft of the separation were missing. Most of the missing engine components were recovered about 2 1/2 miles from the departure end of the runway. The forward and aft portions of the LPT S3 disk were examined. The disk had separated at the fillet radius between the forward spacer arm and the rim forward face. Metallurgical examination of undamaged areas of the disk fracture surfaces found fatigue cracks initiating around the inner diameter of the spacer arm from sites spaced about 0.1 inch to 0.2 inch apart. The cracks had propagated rapidly through the spacer arm thickness and exhibited high-stress, high-cycle fatigue, termed high-amplitude fatigue (HAF), consistent with a high-amplitude per-revolution stimulus. The cracks joined to form a single circumferential crack, which led to the 360° fracture and disk separation. A postincident video borescope inspection (BSI)5 of the engine’s HPT revealed that three HPT stage one (S1) blades over a nine-blade sector were missing airfoil material equivalent to about 1.8 blades. This amount of localized blade material loss can result in a significant increase in the eccentricity of the rotor mass center relative to its axis of rotation (rotor unbalance). On March 26, 2009, an Arrow Cargo McDonnell Douglas DC-10F experienced an uncontained failure of its No. 2 GE CF6-50 engine. There were no injuries. The airplane was operating under the provisions of 14 Code of Federal Regulations Part 121 as a regularly scheduled cargo flight from Eduardo Gomes International Airport, Manaus, Brazil, to El Dorado International Airport, Bogota, Colombia. According to flight crew reports and flight data recorder information, about 30 minutes after takeoff, about 8,000 feet agl, the airplane’s No. 2 engine began to lose oil pressure and N1 decreased. The pilots shut down the engine and diverted to José María Córdova International Airport, Medellín, Colombia, where an uneventful landing was accomplished. Postflight inspection found that the aft end of the No. 2 engine was missing and that there was impact and tearing damage to the airplane’s horizontal stabilizers, tail strut, elevator, and rudder. A teardown examination of the Arrow Cargo engine found that the LPT S3 disk had fractured 360° at the fillet radius between the forward spacer arm and the rim forward face and that all components aft of the LPT S3 nozzles were missing. The liberated engine parts impacted a densely populated area, and 22 homes were reported damaged. Metallurgical examination of the LPT S3 disk fracture surfaces revealed HAF cracks over approximately 90 percent of the fracture, consistent with a high-amplitude per-revolution stimulus. The remaining 10 percent of the fracture showed overstress features. Cracks propagated from initiation sites spaced about 0.1 inch to 0.2 inch around the inner circumference of the spacer arm and joined to form a single circumferential crack, leading to disk separation. Inspection of the HPT rotor found that one HPT S1 blade was missing about 85 percent of its airfoil. On December 17, 2009, a Jett8 Cargo Boeing 747-200F airplane, registration 9V-JEB, experienced an uncontained failure of its No. 4 CF6-50 engine in Singapore. No injuries were reported. According to information provided by the Singapore Air Accident Investigation Bureau, which is investigating this incident, the flight crewmembers reported that, while passing through 7,000 feet agl, they heard a muffled explosion and immediately applied left rudder. Noting rapidly decreasing No. 4 engine oil pressure and N1, the crew performed the engine failure checklist and returned to land the airplane at Singapore Changi International Airport, Changi, Singapore. Post-event inspection found that the aft end of the No. 4 engine was missing and that the lower right wing/pylon, the aft right cargo door, and the vertical stabilizer exhibited damage consistent with impact from high-energy parts. An inspection of the No. 4 engine found that the engine’s LPT S3 disk had separated at the forward spacer arm and that all components aft of the separation were missing. In addition, localized HPT blade deterioration was observed in a video of a BSI provided by the Air Accident Investigation Bureau of Singapore. The NTSB is participating in this investigation. On April 10, 2010, an ACT Cargo Airbus A300B4 experienced an uncontained failure of its No. 2 CF6-50 engine while accelerating for takeoff at Bahrain International Airport, Manama, Bahrain. The crew declared an emergency, rejected the takeoff, activated the fire suppression system, and evacuated the airplane. No injuries were reported. Photographs of parts recovered from the runway indicate that the LPT S3 disk separated at the forward spacer arm. The NTSB is participating in this investigation. The NTSB is coordinating teardowns and inspections of the Jett8 Cargo and the ACT Cargo engines in order to gain more insight into the failures. HPT rotor blades are expected to deteriorate (lose blade airfoil material) between overhaul intervals due to the operating stresses they experience. The blade material loss is usually symmetrical and does not significantly affect rotor balance. However, when the blade material loss is localized, detrimental rotor unbalance will occur, resulting in synchronous, per-revolution vibration. According to GE, when sufficient HP rotor unbalance occurs in the CF6-45/-50 engine, the resulting synchronous vibration forces can interact with the low pressure (LP) rotor system through a common bearing support and excite a bladed-disk mode response8 in the LPT S3 disk. The resonant frequency experienced by the LPT S3 disk in this mode will result in forward spacer arm bending loads that exceed the fatigue limit of the material, which then causes HAF cracks to initiate. The individual cracks can link together, forming a circumferential crack that results in separation of the aft section of the LP rotor. The separated rotor section will penetrate the engine case, releasing high-energy debris. The structural failure of the engine case will result in the liberation of all case-supported components aft of the fracture. The CF6 LPT S3 disk resonance response to HP rotor unbalance was first identified in the GE CF6-6 engine, which shares the CF6-45/-50 type certificate. The CF6-6 experienced four uncontained LPT S3 disk forward spacer arm separations between 1975 and 1978 due to HP rotor unbalance. As a result, GE redesigned the CF6-6 LPT S3 disk so that an HP rotor unbalance condition would not excite the LPT S3 disk and result in disk failure. The CF6-50 engine has experienced 12 instances of LPT S3 disk forward spacer arm cracking since 1973. Eight of the cracked CF6-50 disk forward spacer arms were discovered during shop-level inspections when LPTs were disassembled for unrelated reasons, such as engine model conversion or the replacement of life-limited parts. In the remaining cases, all of which are cited above, disk cracks progressed to failure, leading to in-service uncontained engine failures. Airplane maintenance manuals (AMMs) require inspection of CF6-45/-50 HP rotor blades every 450 flight cycles as part of the engine hot section BSI. However, the Saudia LPT S3 disk failure occurred about 216 flight cycles after the engine’s last hot section BSI, and the Arrow Cargo LPT S3 disk failure occurred about 350 flight cycles after the engine’s last hot section BSI,10 indicating that a 450 cycle hot section BSI interval was not adequate to detect HPT blade deterioration that can result in catastrophic LPT S3 disk failure. On August 28, 2009, GE issued CF6-45/-50 SB 1307, which recommended that operators of CF6-45/-50-powered airplanes conduct an HPT rotor blade BSI every 200 or fewer flight cycles to detect HPT rotor blade material loss earlier, thus potentially preventing unbalance conditions from occurring. The Jett8 Cargo LPT S3 disk failure in December 2009 occurred about 185 flight cycles after the engine’s last hot section BSI. On March 17, 2010, the FAA issued immediate Airworthiness Directive (AD) 2010-06-15, effective April 1, 2010, which requires that CF6-45/-50 HPT rotor blades be subjected to a BSI for excessive HPT rotor blade material loss or damage within 50 flight cycles, repetitive BSIs every 175 flight cycles, and, if excessive HPT blade material loss is found, a fluorescent penetrant inspection (FPI)11 of the LPT S3 disk before further flight. However, the most recent event, which occurred on April 10, 2010, suggests that the current interim measures are not adequate to prevent uncontained CF6-45/-50 LPT S3 disk separations. A review of airplane records indicated that the ACT Cargo engine had been maintained in accordance with GE SB 1307 since November 2009. In addition, the records indicated that an HPT BSI was performed fewer than 50 flight cycles before the LPT S3 disk failure and that no HPT blade material loss was noted. On May 10, 2010, GE issued revision 1 of SB 1307, which recommends an HPT BSI every 75 flight cycles or, if the operator adopts and maintains additional repetitive maintenance and inspection criteria, every 350 flight cycles. The NTSB concludes that the current CF6-45/-50 engine HPT rotor blade BSI interval is not adequate and must be further reduced to detect HPT blade material loss before an HPT unbalance condition can result in an uncontained LPT S3 disk failure. The NTSB believes that BSIs must be performed at an interval such that if undetectable blade loss begins and continues to progress, there is still time to potentially identify the HPT blade loss at the next BSI before an uncontained event is a possibility. Therefore, because of the potential for catastrophic damage to the airplane and passengers from an uncontained engine failure, the NTSB recommends that the FAA immediately require operators of CF6-45/-50-powered airplanes to perform HPT rotor blade BSIs every 15 flight cycles until the LPT S3 disk is replaced with a redesigned disk that can withstand the unbalance vibration forces from the HP rotor. The CF6-45/-50 engine manual requires an FPI of the LPT S3 disk whenever the disk is exposed during rotor disassembly. However, the LPT rotor is not disassembled during every engine shop visit. 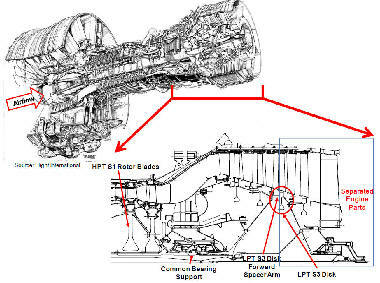 Since December 2008, the CF6-45/-50 engine manual has required an LPT S3 disk FPI to detect HAF cracks at the forward spacer arm that may have resulted from vibration forces, if the reason for engine removal includes a report of excessive HP rotor vibration. However, HP rotor vibration was not reported in the 12 instances where LPT S3 disk HAF cracks were identified either in shop-level inspections or in the uncontained LPT S3 disk failures. Thus, it is unlikely that vibration would be reported in other cases of HPT unbalance that would lead to an LPT S3 disk failure. In addition, GE recently revised the CF6-45/-50 engine manual LPT S3 disk rejection criteria and disk cleaning requirements to improve the detectability of HAF cracks on the forward spacer arm. As a result, some in-service LPT S3 disks have not been inspected in accordance with this improved inspection criteria. The NTSB concludes that there may be LPT S3 disks in service that were exposed to HP rotor unbalance conditions but not inspected to the latest engine manual standards and that, as a result, these disks may have accumulated forward spacer arm HAF damage, making them more susceptible to HPT rotor unbalance. Therefore, the NTSB recommends that the FAA require operators of CF6-45/-50-powered airplanes to perform FPI inspections of CF6-45/-50 LPT S3 disks at every engine shop visit until the LPT S3 disk is replaced with a redesigned disk that can withstand the unbalance vibration forces from the HP rotor. Uncontained turbine engine disk failures present a direct hazard to the airplane and its passengers because high-energy disk fragments can penetrate the cabin or fuel tanks, damage flight control surfaces, or sever flammable fluid or hydraulic lines. Engine cases are not designed to contain failed turbine disks. Instead, the risk of uncontained disk failure is mitigated by designating disks as safety-critical parts. The design process for a safety-critical turbine disk includes consideration of the disk’s critical frequencies and mode shape information so that the part is designed with an adequate margin of safety. In the case of the LPT S3 disk, an adequate margin of safety should have existed between the disk’s natural response frequencies and the engine’s operating frequencies, including the frequencies that result from common fault conditions, such as HP rotor unbalance. Further, an engine vibration monitoring (EVM) system13 can be used to alert flight crews of impending part failure to increase the margin of safety. However, when the CF6-45/-50 engine was being certified, the EVM systems installed on the airplanes that the CF6-45/-50 engines were designed to power were considered marginal in their ability to detect HP rotor unbalance. The FAA considered this special condition satisfied with its acceptance of a GE certification report that concluded that CF6-45/-50 engine unbalance levels high enough to have detrimental effects would be easily detectable by perceived noise and vibrations in the cabin area and in the controls, enabling the flight crew to take corrective action. However, the flight crews of the airplanes that experienced the uncontained CF6-50 LPT S3 disk failures cited above did not report any unusual engine vibration preceding the events. In addition, there were no reports of vibration associated with the removal-from-service of the eight CF6-50 engines in which the cracked LPT S3 disks were discovered during normal teardowns. Thus, the NTSB concludes that GE’s FAA-approved special condition has failed to provide an adequate margin of safety to prevent catastrophic CF6-45/-50 LPT S3 disk failure. Therefore, the NTSB recommends that the FAA immediately require GE to redesign the CF6-45/-50 LPT S3 disk so that it will not fail when exposed to HP rotor unbalance forces. The NTSB also recommends that, once GE has redesigned the CF6-45/-50 LPT S3 disk in accordance with Safety Recommendation A-10-100, the FAA require all operators of CF6-45/-50-powered airplanes to install the newly designed LPT S3 disk at the next maintenance opportunity.